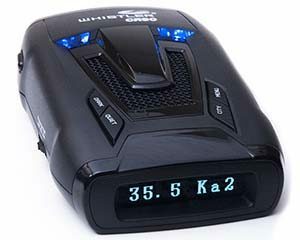 Whistler CR90 warns that this Ka-band signal really is police radar, not a false alarm. Whistler has developed a system that indicates whether a Ka-band alert is genuine or a false alarm that can be ignored. Whistler simplies the task. Non-police signals show only the band and signal stregth. Genuine threats are depicted by an abbreviated, three-digit frequency and to its right, the band and numeric signal strength. Spend ten minutes using the feature and it becomes second nature. Another feature from Whistler, this one exclusive, will identify whether a laser signal is legit. Called LSID (Laser Signal Identification), it displays the laser's PRF or pulse repitition frequency. Although U.S.-spec lasers operate on the same wavelength, most manufacturers' lasers have a unique PRF. An LSID reading of about 200, for example, means you’re likely facing a Kustom Signals Pro Laser 4 or Pro Laser 3, widely sold and very popular with traffic-enforcement officers. This data nugget probably won’t affect the outcome of a typical laser encounter, but could prove useful as a conversational ice-breaker when meeting a bored state trooper.